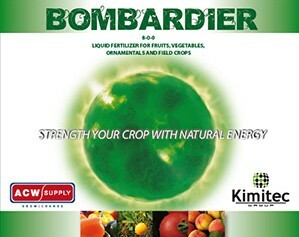 Kimitec Bombardier is a liquid fertilizer obtained from the concentration of selected vegetables. Bombardier has a double action; it improves the soil structure at the same time it increases crop quality. Due to its origin, it presents a high concentration of nitrogen, amino acids, organic matter, polysaccharides, and fulvic acid. The most efficient use of the product is through irrigation, due to the organic matter and humic acid content (improves soil structure), but it is also effective as a foliar spray. When a crop is stressed (drought, over watering, heat, cold) apply immediately at recommended rate.